I had a dream last night in which my friend Matt bought me an oboe. I was distinctly told it was an oboe, though in recollection it looked more like a clarinet. He seemed terribly pleased with himself, and I gamely tried to learn how to play it, knowing all the while that – like whistling – the best I can achieve from any wind instrument is a vague “phoo” sound. Thus, it’s pretty lucky that I never fell in love with the saxophone. Most of the world fell out of love with the saxophone in the 90s, and it’s taken 20 years for the new Summer of Sax to appear. The compilation clip is well worth watching. 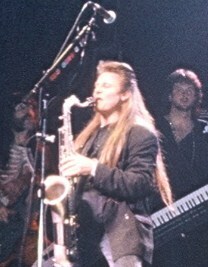 Still, for me, no saxophone serenade compares to the 1989 Venice performance of Money by Pink Floyd, in which Scott Page unleashed his awe-inspiring mullet for a soaring squeakfest of saxy excellence. Scott’s solo is at the two-minute mark, but I was always personally more interested in session cutie-pie Guy Pratt’s bass solo which cuts in at 4’30” and then is frankly just showing off once we get past five minutes. Given how much of a teen crush I had on the guy, I really didn’t mind. I even asked for a bass guitar so one day I could wheedle on a Fender jazz bass, but my parents wouldn’t buy me one on the not-unreasonable grounds that my previous efforts to play guitar like Dave Gilmour manifested as a barely passable Scarborough Fair. Years later, I still can’t play much (haven’t touched the thing in years), and never did get a bass. Guy Pratt, meanwhile, has forged a career for himself as a stand-up comic, with some pretty funny stories to tell. Which just goes to prove that bass players will always be cooler than sax players. Not that I mind the sax – I can think of some great songs with saxophones in them, and you can’t really complain about Baker Street, can you? Roll on, Summer of Sax! I’ve even seen a few mullets around town.